OK, let's just be clear: The National Firearms Act is unconstitutional. It is a specific attack on the right to keep and bear arms which is not supposed to be infringed by the government. It is based on Nazi Germany's gun laws . Second, a bump stock is a device, not a firearm, and the same thing that a bump stock does can be done with a belt loop or simply holding the rifle a certain way. Yet, you were told that you had a friend of the Second Amendment in the White House, something I warned you to be wary about. Now, President Donald Trump and his administration are clearly attacking the Second Amendment. 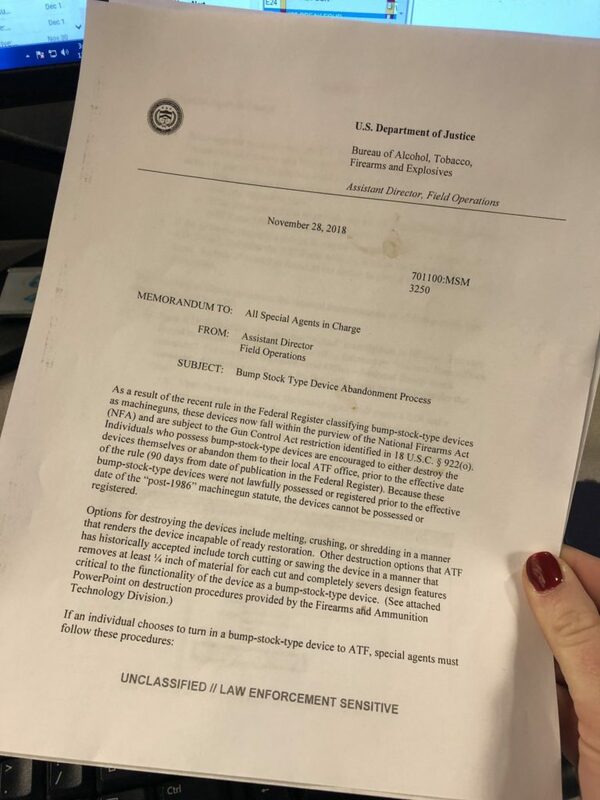 Trump's ATF is now claiming bump stocks are banned, and acting Attorney General Matt Whitaker signed the new rule. Sadly, that rule acts under the color of law, even though only Congress shall make law. Here's a copy of the ATF's reversal, and just so we are clear, it was Obama's ATF that approved the bump stocks. It is Trump's ATF that is banning them. Now, since Congress cannot lawfully restrict or regulate arms or the right of the people to keep and bear them, the NFA is unconstitutional on its face. Congress was never given such authority. Furthermore, since they were not authorized to write such laws, the Executive Branch is not authorized to enforce them, and since they just killed an entire industry with this measure after saying it was perfectly fine less than ten years ago, I can only conclude that this is a political ploy and that Donald Trump is not what he's been saying he is, which is something I've warned about before too. For all the talk about jobs and the economy, Trump just put the nail in the coffin to an entire industry, and rest assured, bump stocks will now become a black market, and law-abiding citizens will be criminalized. Congratulations, President Trump, you've just made yourself an enemy of the people with this measure. What will be next? Outlawing belt loops and fingers and triggers? Or will you just go along with the Commie gun grabbers? Next Franklin Graham: "The God Of Islam & The God Of The Christian Faith Are Not The Same"